Can you believe it’s already November?! This year has flown by, as always. It’s crazy to think we’re just a few short weeks away from Thanksgiving and then Christmas will be here before you know it. In preparation for the new year, which is really right around the corner, we’re looking at some of the design trends that are on the horizon for 2019. Color trend predictions are always a big discussion at the end of the year because there’s are different venues that affect the color trends. There are fashion color trends and interior color trends which oftentimes point in different directions but should both be considered together when evaluating color. The reason for this is that even though the runways and paint companies may say different things, the consumer also has a voice. And many times, the colors that consumers are drawn to for their clothing are the same colors that consumers are drawn to for their homes. We’re not sure about how realistic such a giant color jump would be. While this sort of “color maximalism” is fun for an area or two in your home, it’s a lot. 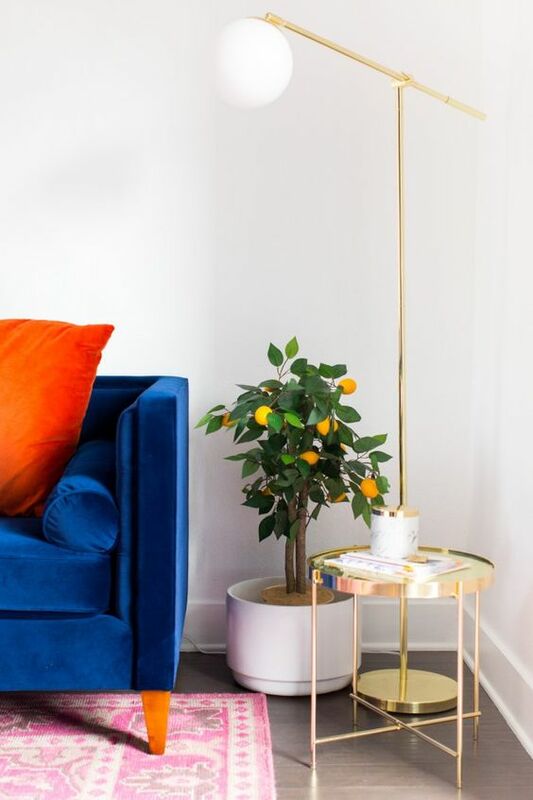 And coming off of the clean, bright white, minimalism that’s been so popular over the past few years, we kindof think that addition of bright color into interior spaces will be a little more gradual. To us, there are certain rooms that seem more appropriate for bright colors and patterns. The powder bath is always a yes to these items because all the rules pretty much go out the window for the powder bath. It’s a small space which would lead some to believe it should be painted bright colors and have minimal patterns to help it feel larger but in reality, the bold wallpapers and bright colors in this room make it feel special, like a little jewel box. Loft areas, mudrooms, and family rooms are also areas where layering bright colors and patterns can be fun and makes sense. These space are more casual and meant for family gatherings so color is a lively way to go. Bedrooms on the other had, especially master bedrooms, should really be relaxing and more serene. Kids bedrooms would be the exception (even though they need their own dose of calm too). 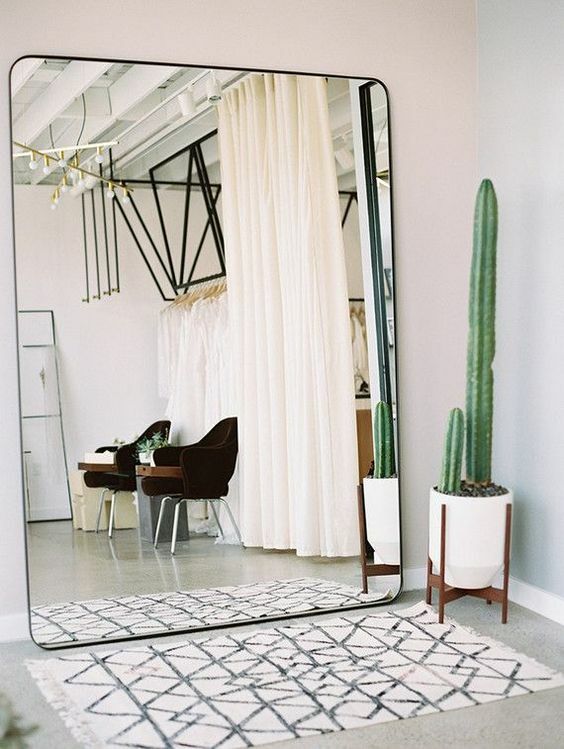 The most important thing is that your home is an accurate reflection of yourself. Bring in bright colors how you like them — big commitment or small commitment. It’s something you’ll have to look at so make sure you are comfortable with it. I often get asked what won’t go out of style. People what to know what is classic and timeless that they can put in their home so they don’t have the pay to have it re-done over and over when it goes out of style. There are a lot of classic elements however, even classic styles can be edged out by other trendy elements that are making their debut. For cabinetry colors, we’re talking about white. For so long, the white, minimalist, clean kitchen was super hot. Put a white kitchen in your home and you’ll never look back. However, the trend in cabinet colors is changing (which you might have already noticed from Pinterest) and white cabinets are as much the hot thing anymore. So what is? Blue. And green. 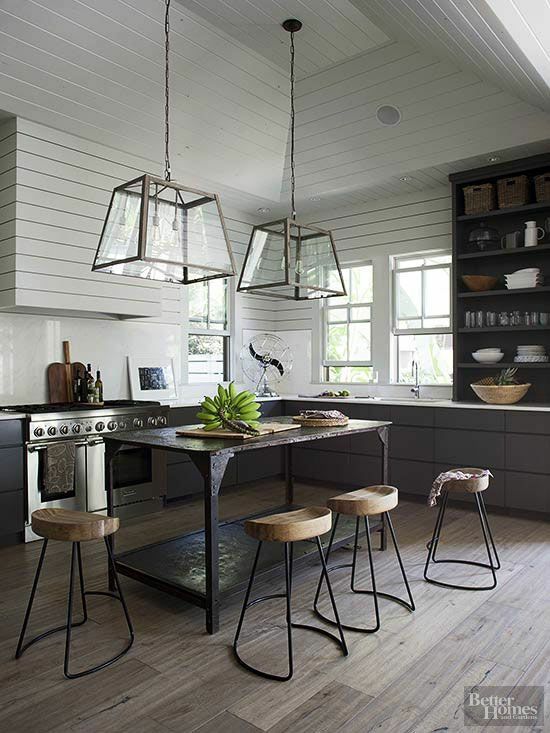 Cabinetry is taking a turn away from the bright look and going a little more earthy and moody. Having blue or green or even a blue-grey kitchen or bathroom is starting to feel a little more modern while white is becoming more traditional. Thats ok, though! We still love a white kitchen and do think white kitchens will be beautiful for a long time, but we have to pay our respects to the next hottest thing too. With the re-emergence of earth tones and lightly stained white oak, the contrast blue provides with this wood tone gives a space lots of depth. Not to mention how fun brass hardware looks against blue cabinetry. Let’s be clear, though, white countertops are still 100% in. So design hasn’t completely abandoned that white element. And many homeowners are even mixing some white cabinetry with some blue or green or gray cabinetry PLUS adding a dash of natural wood tones. So it’s really more about mixing, now. Oftentimes, people put money into updating their kitchen and they want it to be "classic". Meaning, they want it to stand the test of time and be something that will transition well within the ever-changing design trends. I truly think it's impossible to design something that will ALWAYS be in style. However, I don't think it's impossible to design something that the homeowner will love for a long time. But that really depends on the home owner and what they like. Right now, there are some key design trends that will most likely transition well as what's popular in kitchens evolves. So instead of telling you about a style that you'll never have to change again, we'll tell you about what's popular right now and you can decide if you like it or not and how it blends with your current (and/or future) furnishings. Many people are getting more expressive and brave with their cabinet colors. Where white cabinets were the thing, blue or some version of it has become the new neutral in kitchens. It gives your cabinets a little color but this "color" is also pretty neutral and blends well with pretty much anything ---like jeans go with anything. You can mix blue cabinets with whites, greys, and wood tones. This gives your kitchen a lot of depth and makes it look way more custom. You've probably noticed that open shelving is all over Pinterest. It's that minimal look that allows you to keep an open, airy feeling while also keeping some storage options. It's fun and interesting but definitely a trend that will not blend well with other styles that come and go. We love it but would recommend doing it in small bits if you're not wanting to make a lot of changes later. Lots and lots of white and lots and lots of light are huge in kitchens right now. The white reflects the light and makes everything feel much more open. The element is important for good design regardless of what is currently trending because it makes you feel like you have more space and that will never get old! Finally, we'd be lying if we said kitchen cabinets were shaker, are shaker, and will be shaker. That clean style--straight lines, squared corners, and a simple recessed panel is pretty much always going to go with anything so while it's hot now, you're not buying into a trend, you're buying into a classic look! The Kitchen & Bath Industry Show was held just recently here in Orlando. Vendors, builders, designers, and tons of other professionals in the home industry attended to see all the new offerings available. Since Kitchen & Bath is such a huge part of the interior design industry because....well, like we always say, kitchens and bathrooms sell homes, this is a big deal event where many trends within the industry are displayed and forecasted. According to this article in Houzz, there were a number of trends that presented themselves very prominently so we wanted to share these with you! Just like in the kitchen, furniture style pieces are becoming popular in the bathroom as well. While vanities have always been a necessity in a fully-functioning bathroom (that needs storage), many bathrooms have built-in cabinetry vanities. Now, according to what was shown at KBIS, many people are moving towards the wooden, furniture style vanity look that isn't necessarily built-in. We've seen this style a lot in a number of the California Coastal homes that are covering the pages of Pinterest. It's pretty much set that quartz is the preferred countertop for bathrooms. The durability of it is hard to beat and the price is becoming more and more competitive. Colors and movement has also increased in variety because so many different vendors are offering their version. Keeping colors neutral is still the trend for bathrooms according to KBIS. Greys and whites haven't gone away yet and with the increasing availability of stone-look porcelain that has it's own grey veining, neutral colors blend well with these materials. Black is popping up more and more, though, in vanity style and we think black is going to be the new neutral for cabinetry in 2018. Shockingly enough, according to what was shown at KBIS, nickel is still holding it's own for faucet finishes. Brass isn't gone yet but nickel is creeping back into the scene. Many people are even mixing finishes in a bathroom using a nickel faucet with gold light fixtures. The nice thing about nickel is that it mixes well with other finishes too, like bronze and even black. In other, less surprising news, under mount sinks and free standing bathtubs are still going strong in bathrooms. The functionality of an under mount sink is hard to beat and it's always a clean look when coupled with a nice eased edge quartz. 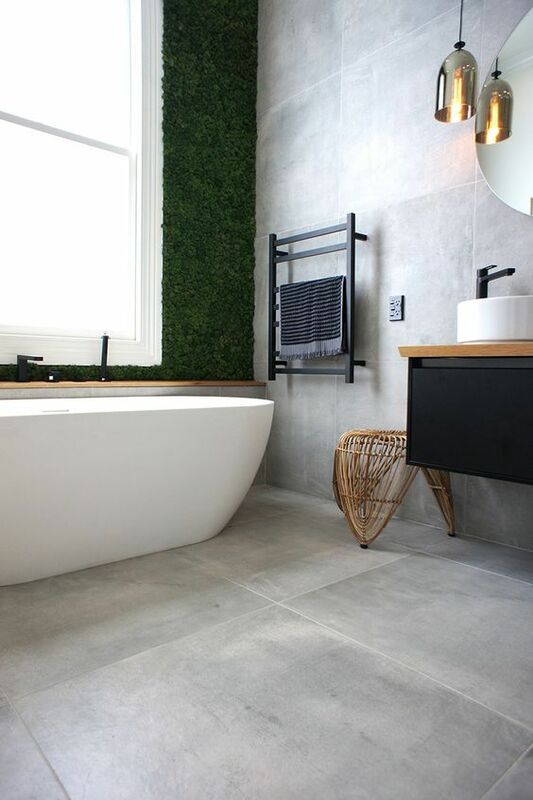 Free standing tubs are holding their own to create that focal point in bathrooms that feels more like furniture and less like part of the floor. There are also a huge variety of free standing tubs to pick from now, making it easier for consumers to incorporate it into their own homes. Finally, and this is really the trend within interiors, LED lighting is super popular. LED lights last longer, are more energy efficient and are much brighter which makes seeing yourself in the mirror much easier! Overall, we're excited about the way kitchen trends are moving. 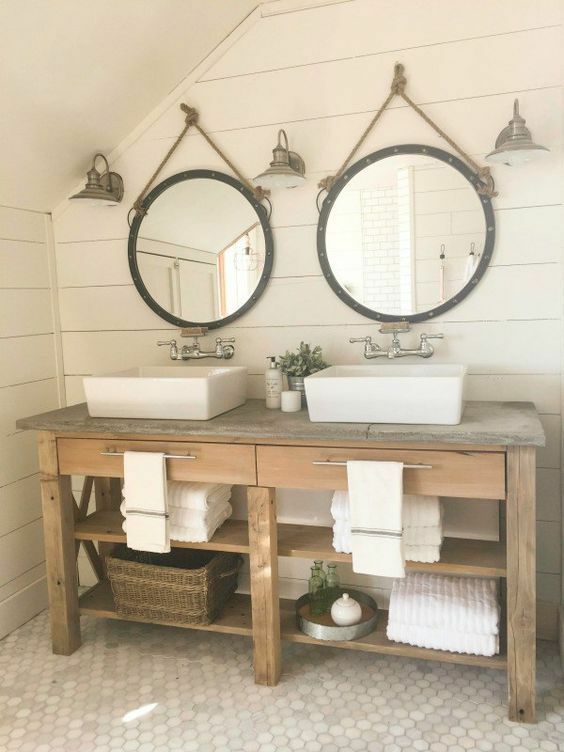 Some of it is more of the same holding it's own, but the design elements that are doing this are solid elements that make for a beautiful bathroom.